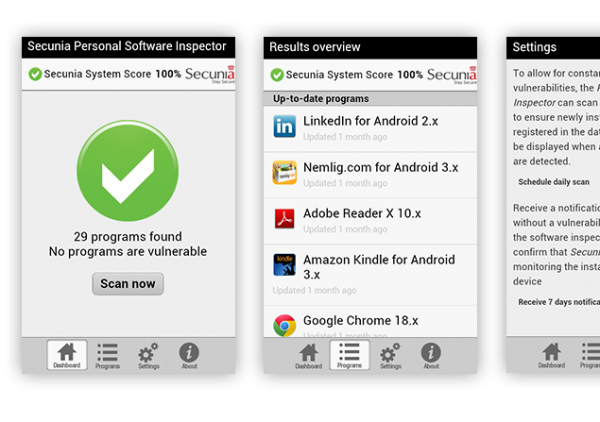 The Secunia Personal Software Inspector for Android is a free smartphone security solution that identifies vulnerabilities in non-Android (third-party) programs which can leave your phone open to attacks. Simply put, it scans software on your phone and identifies programs in need of security updates to safeguard your device and everything on it from cybercriminals. Secunia PSI for Android scans apps downloaded from Google Play as well as apps from external sources. It alerts the user to apps with known vulnerabilities and whether there are updates which should be implemented for security reasons. The beauty of the Secunia PSI for Android solution is that is serves as a validation mechanism and assurance stamp because it checks that security updates are performed quickly.